Hundreds of mourners this morning gathered at the University Chapel at the University of the West Indies, Mona for the funeral of broadcaster Dorraine Samuels. Samuels, who began her media career in January 1981, died on March 26, ending her battle with pancreatic cancer. 12:20: The funeral for broadcaster Dorraine Samuels comes to an end after two hours of tributes in words and songs. The tune 'Time to Say Goodbye' plays from the organ as mourners file from the University Chapel. 12:04: The University Choir delivers praise and worship songs which brought mourners to their feet clapping and dancing along. Some Government and Opposition members could rocked in their seats. 11:45 a.m: A special offering is collected for the Dorraine Samuels Cancer Fund to assist the Jamaica Cancer Society with public education and other activities to raise awareness about the disease. 11:23 a.m: Michael Sharpe, longtime colleague and friend delivers the first scripture reading, Psalms 46. Dorraine Samuels joined Sharpe as an anchor for Prime Time News in 2004. They were the faces of the news for numerous years and maintained a close relationship even after Sharpe stopped presenting. 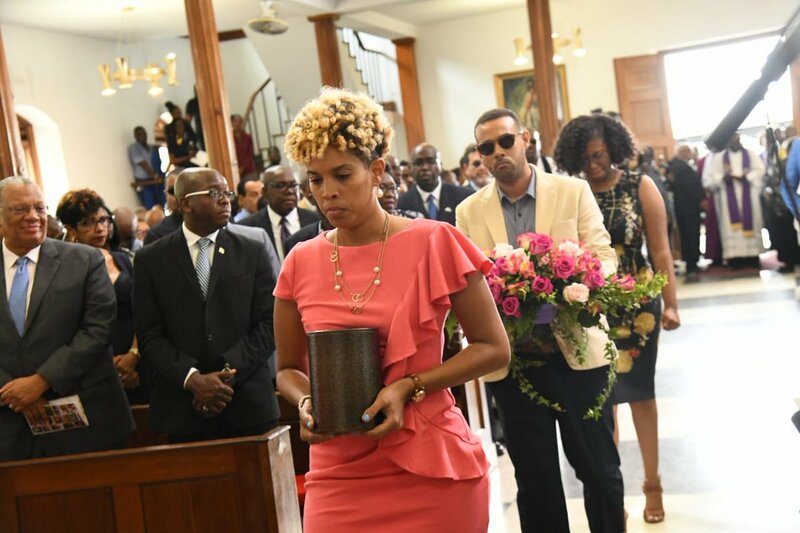 11:12 a.m: Dorraine Samuels' children Melissa, Morgan and Russell bring the urn bearing the remains of their mother to the alter. The pastor then invites the congregation to sing the hymn ‘Enter into Jerusalem’. 10:33 a.m: Gary Allen, CEO of RJRGLEANER Communications Group pays tribute to his longtime broadcaster. He said words were not enough to retell her stories or express the depth of her loss. "Nothing could have prepared us for this pass month, the loss of three of our colleagues in 10 days but Dorraine’s loss was most painful," Allen said. "You inspired many and you made us proud. Walk good our friend, your memory will not die and we will never forget." 10:08 a.m: Dorraine Samuels’ children Melissa, Russell and Morgan deliver a tribute to their mother.​ Melissa, who read the tributes on behalf of her and her younger siblings, said her mother was the light of her life who taught her to not only be an excellent mother but also taught her thrifty spending. “My mother was an amazing person one who always led by example. As a mother she loved us fiercely and was consistent in that love. I will miss sitting down at the kitchen table with her and make her laugh with my dry jokes," Russell wrote in his tribute. "The man that I am today is a true testament from what I learned from her". Morgan wrote that she loved her mother then and now. "The thought of you gone is still unbelievable and will always be. You loved me for me and I never failed to tell you how much I love you too. I may not have you around to talk after a stressful day but I will always have you in my heart,” she wrote. 10:01 a.m: The thanksgiving service begins for broadcaster, Dorraine Samuels. 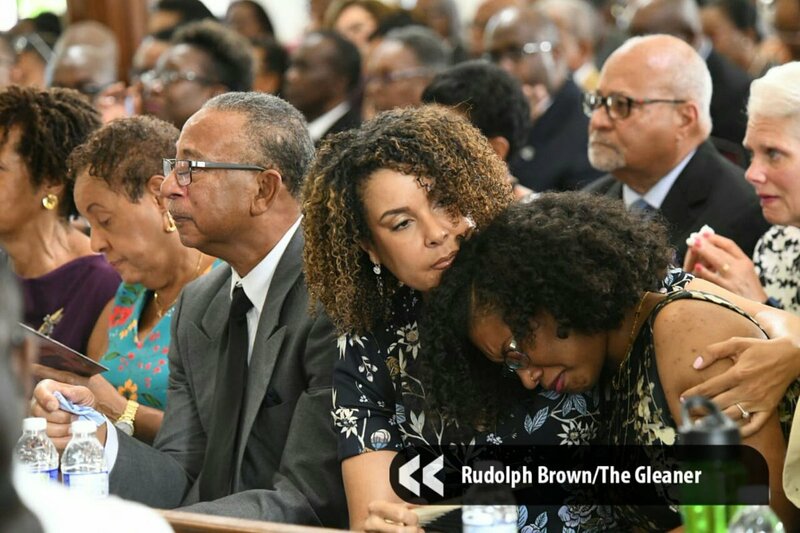 Government and Opposition members, civic and business leaders are among the hundreds of mourners at the University Chapel at the University of the West Indies, Mona. 9:45 a.m: Mourners file in for #DorraineFarewell at the University Chapel. Fellow St Hugh's High School alumna Director of Public P Paula Llewellyn are among them. "She used to make the best cakes," Llewellyn said ahead of signing the condolence book.